BondSt, located on 6 Bond Street in NYC, is known to be one of the best sushi restaurants in Manhatten. My friends who live in Brooklyn took me there, and swore it was the best sushi in the city. I talked to many other people, read many reviews, and everyone at the restaurant lounge who I spoke to who were regulars there that lived in NYC, swore it’s the best. Living in LA, I have high expectations when it comes to sushi. There are thousands of great sushi spots in and around LA so I was pretty excited to try the best in NYC. BondSt is located on a quiet street in NoHo, and there isn’t even a name on the outside of the restaurant- just the address. We walked in and the table wasn’t ready so they recommended us to go out the door and down stairs (as if you were going underground), to the lounge and have a drink as we wait for the table. The lounge was packed and had a very cool, hipster vibe. It was very dim light and there were different rooms with curtains and black leather benches low to the ground that people were sitting around ordering food and drinks. The bar was also packed with people and music was loud. 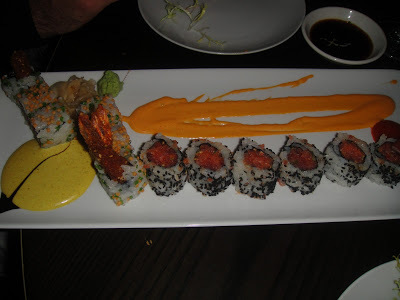 It was a cool vibe, kinda similar to Geisha House in LA, but more classier and upscale. I defintely had a different vibe than the restaurant upstairs which was way more quiet. We were starving so we order a coupleof excellent appetizers while we waited for our table. ~Sea Bass Skewers with a sweet miso glaze- One of the best things I ever put in my mouth. They were melt in your mouth amazing. HIGHLY recommend. ~Big Eye Tuna Tarts with Creamy Ponzu, White Truffle Oil, & Micro Shisho- They are known for this appetizer, one of their most popular. It was very good, but not as good as the sea bass skewers. Spicy Crispy Shrimp- Soooo delicious!!! One of my favs. Seared Tuna & Foie Gras- The fish is so fresh tasting! Sesame Crusted Shrimp roll– Very unique. Especially with the curry sauce. Wan’t used to the taste but I appreciated it nonetheless. Worth a try! ~Lychee Panna Cotta with a Rasberry Compote- Unique and light dessert.